Pale green patterns tinted the water along the Namibian coast in late February 2012. But unlike other bright hues that occasionally show up in the ocean, these colors didn’t result from a phytoplankton bloom. Scientists have long known that hydrogen sulfide gas is emitted periodically along the Namibian coast. Ocean currents carry oxygen-poor water to the region, and chemical and biological processes can deplete what little oxygen is available. The sediments in the local seafloor are also rich with organic matter. When organic matter decays in an oxygen-poor environment, hydrogen sulfide emissions can result. Before the satellite era, residents of the region could detect the hydrogen sulfide emissions thanks to the pervasive rotten-egg smell. 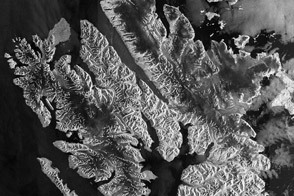 But satellites’ “eyes in the sky” have shown just how big and long-lasting the emission events can be. 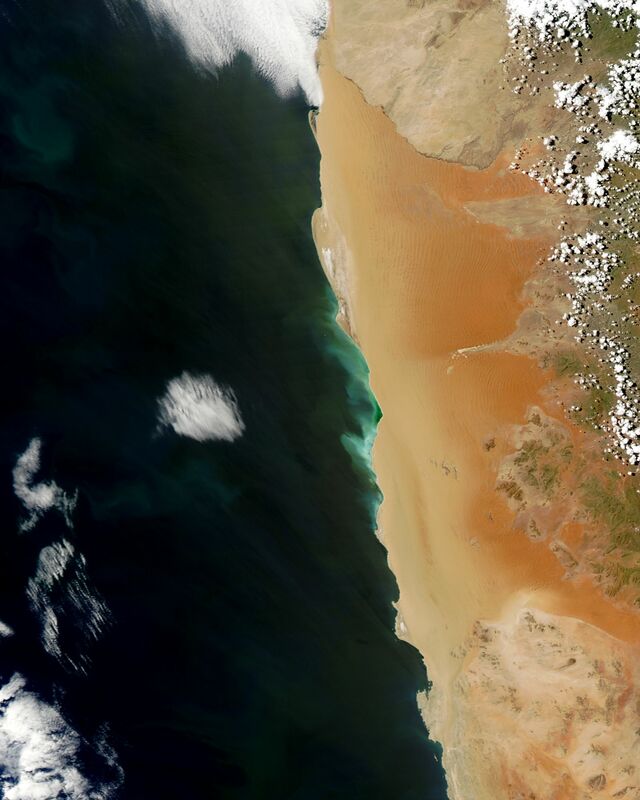 The Moderate Resolution Imaging Spectroradiometer (MODIS) on NASA’s Aqua satellite captured this natural-color image on February 29, 2012. 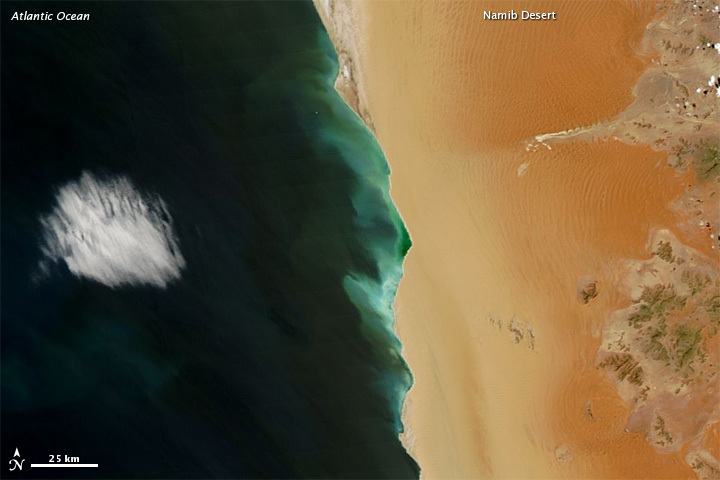 The pale-hued surface waters snake along the shore of the Namib Desert, stretching roughly 150 kilometers (90 miles). 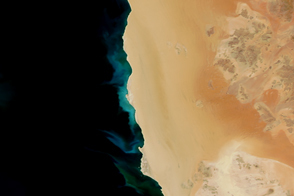 The milky-green colors along Namibia’s coast indicate high concentrations of sulfur and low concentrations of oxygen. Episodes like this aren’t just colorful, they are actually toxic to local marine organisms. Fish die in the low-oxygen water; however, what is deadly for the fish can be good for birds that feed on their carcasses. Likewise, lobsters crawling onto shore to escape the toxic seawater can make meals for locals. And some species of foraminifera—tiny shelled marine organisms—actually thrive in the oxygen-poor sea floor sediments off the Namibian coast. 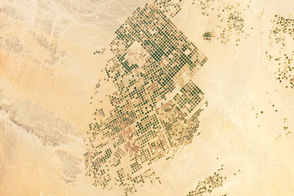 Bright green hues span roughly 150 kilometers along the Namibian coast, the result of gaseous eruptions from the ocean depths. Brüchert, V., Currie, B., Peard, K.R. (2009). Hydrogen sulphide and methane emissions on the central Namibian shelf. Progress in Oceanography, 83, 169–179. Leiter, C., Altenbach, A.V. (2010). Benthic foraminifera from the diatomaceous mud belt off Namibia: characteristic species for severe anoxia. Paleontologia Electronica, 15(1). 13.2.11A. Why Files. (2002). The Biggest Burp. Accessed March 1, 2012.